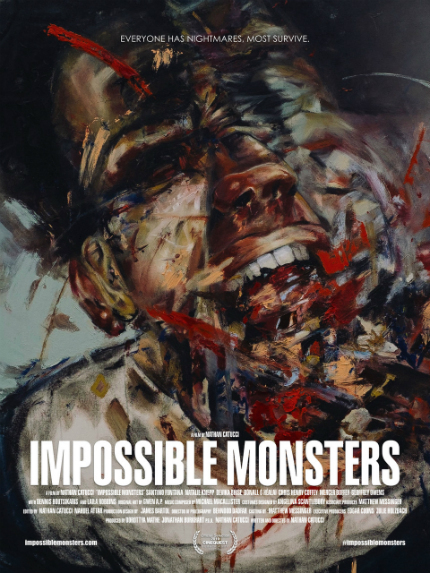 Heading for its world premiere at the Cinequest Film Festival on Saturday, March 9, psychological thriller Impossible Monsters sounds mighty nightmarish. So maybe it's best to watch our exclusive clip in the daylight hours? What's it about? Here's the official description: "Dr. Rich Freeman (Santino Fontana), an ambitious and well-liked psychology professor, pursues a sleep study with a focus on nightmares, dreams, and sleep paralysis -- the success of which would result in a lucrative grant. As the line between dreams and reality blur, a member of the study is murdered, and everything begins to unravel, leaving Dr. Freeman fighting to make things right." Oh, those lucrative grants! They always seem to motivate scientists and other professional people to do things they wouldn't otherwise be tempted to do -- but let me stop right there and rant elsewhere. The clip focuses on a moment of truth, when the good doctor proposes something and is met with a stern admonition. Nathan Catucci wrote and directed. Santino Fontana (star of the upcoming Broadway production of Tootsie), Natalie Knepp, Devika Bhise, Donall O Healai, Geoffrey Owens (The Cosby Show), Dennis Boutsikaris (Better Call Saul), and Laila Robins (Homeland) star. Dorottya Mathe, Jonathan Burkhart and Nathan Catucci produced. Watch the clip below. Impossible Monsters will enjoy its world premiere at the Cinequest Film Festival in San Jose, California on Saturday, March 9, 2019.